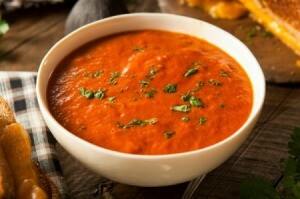 The slightly sweet flavor of basil is a nice complement to that of your fresh or canned tomatoes in these yummy soups. Add grilled cheese sandwiches or a salad and lunch or dinner is served. This page contains recipes for homemade basil tomato soup. An easy supper using the fresh summer bounty! Add the onion and tomatoes to the chicken stock, bring to a boil. Simmer on low for 20 minutes, adding remaining ingredients. Add additional seasoning if desired (I didn't). Let cool. Whirl with an immersion blender. 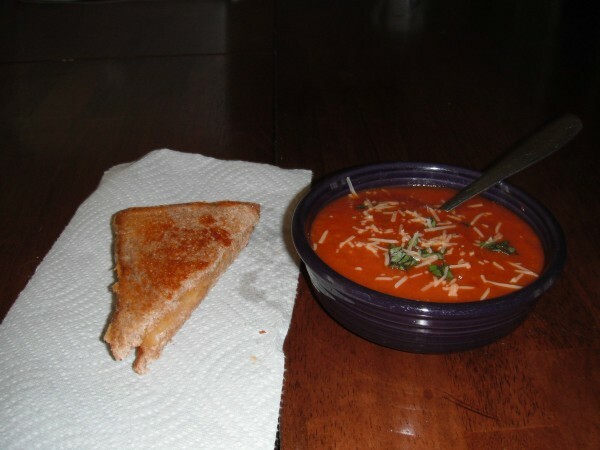 Serve with grilled cheese sandwiches on the side. 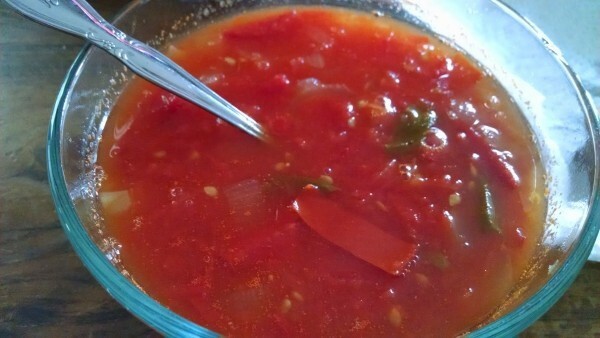 I made this fresh tomato soup using only a couple of days harvest of heirloom tomatoes (7 lbs!) from this year's garden. I also grew the basil, garlic and zucchini. I thought it turned out really well. It was even better the next day. If you don't want to make such a big batch, just scale down the ingredients. This type of soup is very forgiving so I bet you could add in any other herbs or veggies that you may have on hand. Heat olive oil at a medium heat in a heavy bottomed pot. Add onions and cook for a few minutes, then add minced garlic. Cook mixture until the onions are softened but not brown, stirring often. Add celery, carrot and zucchini. 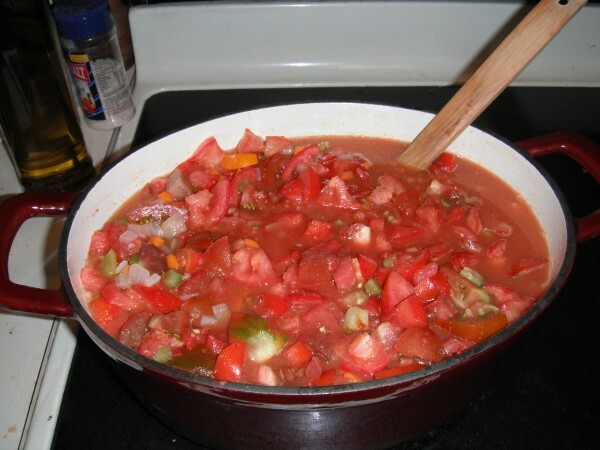 Cook about 5 minutes until softened, then add chopped tomatoes, tomato paste and cider vinegar. Add liquid to make soup like consistency (about 1 qt.) and stir well. Heat mixture to just a boil, making sure not to allow bottom to scorch. Turn heat to low and keep soup on a simmer for about an hour. 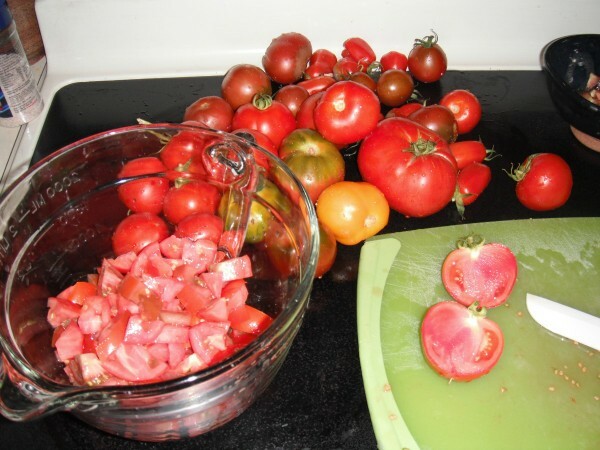 The longer it cooks, the more broken down the tomatoes and vegetables will be. When soup is done, remove from heat. Add chopped basil. Use an immersion blender to process the basil, tomatoes and vegetables into a slightly chunky consistancy. You can also use a blender, just be sure to remove but cover the top to allow the steam to vent. Add salt and pepper to taste. We served up some grilled cheese sandwiches to round out our lunch. I garnished the soup with some more chopped basil and parmesan cheese. It would be great with crunchy cheese croutons too. My husband thought it would have made a great pasta sauce if we had cooked it down for longer.